Today the long way home started. We packed up and tried to get an early start, as I wanted to cover as much distance as possible after dropping Nat at Geneva airport in order to avoid a long ride the following day, as I did not want to take the motorway on my last day on the road. We decided to avoid the motorway going to Bern and cut across the mountains on road 11, which took us to Aigle, and from there we rode along Lake Lehman’s southern bank to Geneva. It was a beautiful morning and the traffic was quite light, allowing us to enjoy our last few hours together on this trip. We made it to Geneva airport in good time, and kissed goodbye in front of the terminal. I looked down at my GPS and instead of entering the coordinates for my next destination as I had been doing for more than two months, I pressed “home”. Set to avoid motorways and toll roads, it showed I had a long way to go, but I had two days ahead of me. I waved goodbye and rode off. Having Nat with me for so long had been a very pleasant surprise, and I felt a bit lonely as I hit the road out of Geneva. I was running low on fuel, but I thought that I would stop to fill up once I was out of the city. It turned out to be a mistake. I rode for a long while without seeing a petrol station, and I was getting a bit nervous – the tank was practically empty, and I did not have any fuel in the jerrycan, I had put what was in it into the tank once I was back in Europe, thinking I would have no problems here. I set the GPS to find a petrol station even if it meant leaving the road I was travelling on, and it sent me into a sleepy French town where I found a deserted supermarket petrol station after some backstreet riding. Luckily enough, the pump accepted my credit card and I was able to fill up. However, when I got back on the bike I saw that the GPS was now giving me a much longer route back home than before. I tried to reprogram it, but then it said that the route was too long and it was not able to calculate it. I rode out of the town in the general direction I knew I had to go, hoping I would be able to program it further along. It was hopeless, it refused to give me a way back that was not on the motorway. I did not have a paper map, and navigating French back roads can be a nightmare if you do not know where you are going. By early evening I was too tired to travel like that and decided to take the motorway, go as far as I could that day and then find a campsite. I made it past Montélimar, where I stopped once again for petrol. I checked the GPS and voilà! There was a campsite just 12 km from where I was. I was not expecting anything great, just somewhere to spend the night, but the area around the campsite was quite beautiful, and once more, I regretted not having enough time to see a bit more. It was almost dark by the time I had finished setting up the tent, so I ordered a beer at the bar, had some dinner and went to bed. 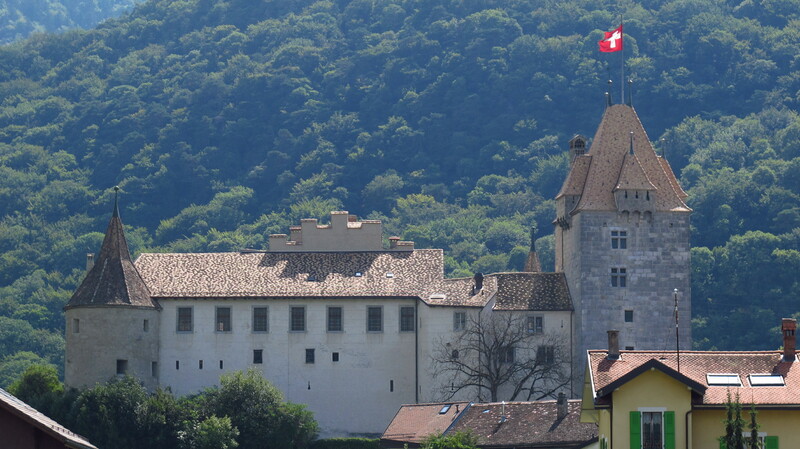 This entry was posted in Stroming The World 2013, Travel and tagged Aigle, France, Geneva, Montélimar, STW 2013 by Kilian. Bookmark the permalink.